Designed to replace the crystal oscillator LO chain in a DB6NT 10GHz Transverter unit or your own Transverter design, the Model 2556-ALN will provide superior low noise performance almost equaling the Phase Noise performance of a crystal oscillator multiplier chain. 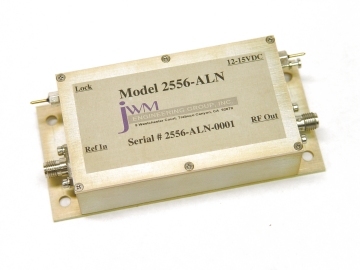 The Model 2556-ALN outputs a single ultra low noise 2556 MHz signal. With a minimum of +17 dBm of output power, the oscillator is perfect for driving 3-dB power spliiters, multipliers and power amplifier stages. The ultra low noise performance of the Model 2556-ALN begins to approach crystal oscillator phase noise performance. This allows the unit to be used for such things as EME communications, long-haul low noise communications and digital operations like JT65 and similar modes. With both end of a communications link using a Model 2556-ALN, both stations will be absolutly on the same frequency when locked to a 10 MHz GPS disiplined oscillator reference. No more hunting around the dial for the other operator. NOTE: Custom frequencies are available on special order. Consult JWM Engineering Group for information and pricing. Contact JWM Engineering Group by EMail to place an Order or for availability. Notice: Prices and Specifications are subject to change without notice. Please contact JWM Engineering Group for the latest prices.